These carbonless automated cash receipts are coil-bound with 200 3-part sets per book. The metal coil-binding allows our book to always lay flat regardless of what page you are writing on from the first page to the last page. 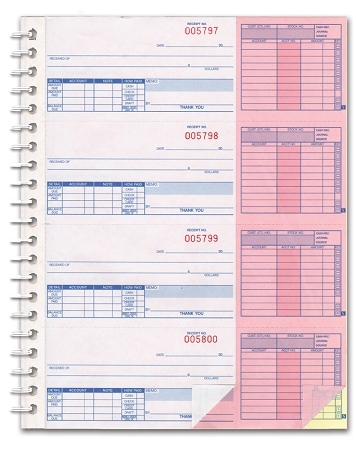 Our automated receipt books have an extra heavy cover and back with a wrap-around cover to prevent write through of more than one set at a time. Our book is a convenient 8-1/2” x 11” with each individual receipt measuring 2-3/4” high by 8” wide. Part one is short without accounting information. Part one and two are fully perforated so it will provide a permanent reference record. Paper colors are White, Pink, Canary. Available from our stock prenumbered (no choice of starting number), or available imprinted with your choice of starting number on 5 books and up. Packaged 1 Book (200 Receipts) per pack.